Soviet designs for Mars expeditions to a common scale. Left to right, top to bottom: MPK, TMK-1, Mavr; TMK-E early concept, TMK-E final design; two alternate MEK designs; MK-700; Mars 1986; Kurchatov Mars 1989 design; RKK Energia solar-powered Mars 1989 design; NII-TP/Keldysh Mars 1994 design. The orange line is 100 m long. Aelita was the Queen of Mars in the famous socialist parable filmed by Jakov Protazanov in 1924. It was altogether fitting that her name would be given to the leading Soviet plan for the conquest of the Red Planet. The Soviet Union's Korolev had the same original dream as Wernher von Braun - a manned expedition to Mars. In both cases this goal was interrupted by the 'side show' of the moon race of the 1960's. In both cases that race proved so costly and of so little public interest that political support for any Mars expeditions evaporated. The very first analysis of a manned Mars landing expedition, by Tikhonravov in 1956, indicated that use of conventional chemical propulsion would result in a spacecraft with a starting mass of 1,630 metric tons in low earth orbit. 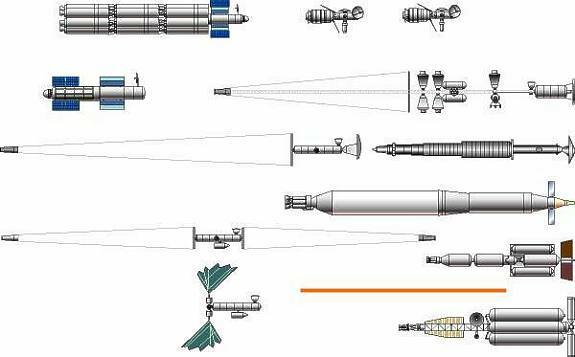 This would require two dozen launches of the projected N1 launch vehicle with assembly of as many rocket stages in space. It was decided early on that chemical propulsion would only be useful for a manned Mars flyby, which required only one N1 launch. Therefore in the period 1960 to 1990 the Soviet Union developed to flight-readiness stage two forms of highly efficient nuclear propulsion: nuclear thermal (liquid hydrogen is passed through a reactor, heated, and expanded out of a conventional rocket nozzle) and nuclear electric (xenon or another element is ionized and accelerated by electric or magnetic fields to high velocities). The original Soviet Chief Designer, Sergei Korolev, favored the nuclear electric approach, and this was the basis for all of the Mars expedition concepts of his OKB-1 design bureau (now RKK Energia). Coincident with the fall of the Soviet Union and the rise of environmental consciousness, RKK Energia designs retained the ion propulsion bur replaced the nuclear reactor with vast solar panels. Other design bureaus and institutes adopted nuclear thermal propulsion for their Mars spacecraft concepts, most notably Vladimir Chelomei's MK-700. Details of the development of these technologies can be found at Soviet Mars Expedition Propulsion - Nuclear Electric and Soviet Mars Expedition Propulsion - Nuclear Thermal. The first Soviet manned Mars flyby Heavy Piloted Interplanetary Spacecraft (TMK) was to be launched by a single N1 launch vehicle. In fact the requirements for executing the TMK project would decisively shape the specifications for the N1. One reason the Soviet Union did not beat America in the moon race was that the N1 was sized to launch the 75-metric ton TMK rather than a 150-metric ton direct-landing moon mission. For nuclear-electric powered manned Mars landing expeditions, several launches of the N1 or uprated N1M would be required, with assembly of the spacecraft in earth orbit. Vladimir Chelomei proposed his enormous UR-700M launch vehicle in order to minimize the number of launches and dockings in earth orbit required to assemble a Mars spacecraft (similar analyses by NASA led to proposals for the Nova booster). Even with a payload of 750 metric tons two launches were required to assemble the spacecraft. A Soviet state commission in 1972 terminated further work on Mars expeditions. The cancellation of the N1 launch vehicle in 1974 eliminated Russian capability to launch such spacecraft. After rejecting Glushko's RLA series of rockets, Russia in 1976 started development of the Energia heavy lift vehicle (88 metric tons into low earth orbit). Beginning in 1978 NPO Energia updated their Mars spacecraft design for launch by Energia. After the collapse of the Soviet Union, this launch vehicle in turn was abandoned, again ending any launch capability to support manned Mars flight. Revival of the Energia production line was proposed throughout the 1990's and beyond as a means of obtaining the heavy launch capability required for Russian, American, or international Mars expeditions. The original TMK-1 living quarters for a crew of three on a flight to Mars and back was a 6 m diameter module, 12 m long. The TMK-E used a version of this stretched to 18 m to accommodate a crew twice as large. These modules reflected contemporary designs for 6 m-diameter N1-launched earth space stations. The MEK of 1969 and all subsequent OKB-1-Energia designs used 4.1 m diameter modules, 23 m long, later in two sections. This diameter indicates commonality with Salyut and Mir space station hardware. Interestingly the 6 m diameter module was resurrected in 2000 to provide the living quarters for the Forpost Mars orbiter proposal. Designs by bureaus outside of OKB-1 used very differently-sized crew quarters. The original 1960 TMK-E landing craft were 10 metric ton conical aeroshells with a blunt base, 5.5 m in diameter and 9 m in height. On the surface the shell would separate and a section of it would provide a carapace for the vehicles within. By 1966 data from American Mariner probes showed that the Martian atmosphere was much thinner than had been thought. The multiple conical landers were replaced by the large single 20 metric ton MPK with an asymmetric aeroshell, about 11 m in diameter and 8.5 m tall. By 1978 this was replaced by a completely different vehicle, a horizontal-landing cylinder with a simple conical nose. This EA was 3.8 m in diameter and 13 m long. . This became the baseline for subsequent RKK Energia designs. No details of Chelomei's proposed lander have emerged, although the control cabin and ascent stage likely would have been based on his LK-700 lunar lander. The original TMK-E design called for five separately-landed rover vehicles to be linked to together to form a �Mars Train' to explore the surface. This nuclear-powered assembly would have provided crew quarters and even a launch platform for a VTOL aircraft for flying through the atmosphere. This was simplified drastically by 1966 with the single MPK lander containing the crew quarters. The MPK and the following EA landers were limited to one-week stays on the surface and were equipped with more modest Marsokhod surface rovers to provide crew mobility. The 1956 MPK expedition had an earth re-entry vehicle of 15 metric tons to return the crew of six to earth. The 1960 TMK-1 and TMK-E returned the crew of three in a re-entry capsule 4 m in diameter and 3.75 m long. This ancestor of the Soyuz capsule had a blunt ogive heat shield. The recovery Apparatus (VA)of the 1969 MEK design was enlarged form of the Soyuz 'headlight' re-entry capsule shape with a heat shield wider than the base diameter of the spacecraft. The 10 metric ton VA would have a hypersonic lift to drag ration of 0.45 to minimize G-loads on return and a basic diameter of 4.35 m, a height of 3.15 m, and a lens-shaped base of 6 m diameter. The same design was used in subsequent RKK Energia Mars spacecraft. The earth return vehicle for Chelomei's MK-700 was an enlarged version of his Apollo-shaped TKS capsule. A 1994 nuclear thermal Mars ship design used the EA Mars lander design for earth re-entry as well.